What Are Your Goals in Forex? When people asks me what I do for a living and tell them I have a business called forex trading, people always jump out of joy and ask me to teach them how to do it. It seems that is rare for someone to encounter such a breed of people that you won’t be able to hide your joy and ask questions. It is a pleasure for me to teach. But it can quickly becomes a frustration when people don’t have the willingness to learn. Only the willingness to ask. There are a lot of forex tutorials, resources and beginner tools on the subject that its quite frustrating now to explain fibonacci, limit orders, SMA, margin and leverage to an average person. We all have those basic stuff online and for free. If you come across a forex trader in your life, do not scare him away by asking newbie questions. Educate yourself first so you can ask interesting question that would express your willingness to learn. You may build a good relationship with that person and might improve your trading. In a business where your character will be tested, I think everyone should be willing to learn by themselves because after all, it is your money. First ask the question, what is your goal for trading forex. Is it to become a millionaire overnight? Is it to retire young? Or is it just a vehicle for you for wealth building? Whatever your answer to this question ultimately lead to what kind of strategy you will utilize. Every person is different. And every person have a kind of threshold where he can take a loss and not quit. Everybody is different. So learn about yourself. And create your own strategy. Master the fundamentals and you’ll be able to learn faster. And most importantly, be patient and have self discipline. I do have my personal goal in forex when I started out last year. I haven’t achieve this goal yet. But I’m seeing positive results now more than ever. And that’s because I never stopped learning. Whatever your goals are in forex, I wish you good luck. People are greedy. That’s a fact. But its the emotion that keeps us wanting more and always wanting to have the things we want. Makes us think of ways on how to get it. Don’t fear greed. Make use of it. Master it. Most newbie traders, me and my friend, talked about the profits in trading. One of us will argue that to have great profits you need to have large amounts of pips in a winning trade. Ok. Fair enough. More pips = more profits. Think about this, you have $1M in your account as capital. And your target profit in terms of pips is in the 200+ pip range. Sounds like a lot money to be made when you get that 200+ pip. But think of the risk you will get and also the time before you get to profit. In forex trading, there are fluctuations, can you stay calm when your account displays -100pip because of its initial retracement? Can you still decide if the trend is against you or its just a retracement? Remember, earning that kind of pip will require you to hold the trade from 1 hr to 1 day. Can you handle the pressure? I say, pip size doesn’t matter. How much you risk in each trade matters. Playing with small profit pips will reduce risk. And also, having a profit target that’s small will minimize risk. Smaller pips means, shorter time inside a trade which means lesser risk, less pressure from greed or fear. Pip size doesn’t matter, volume does. Increase your volume once you got the thing going. Increase more to profit more, while still maintaining the same pip per trade profit. And always remember, don’t overtrade. Take a time out. Every businessman needs his vacation once in a while. New to Forex Trading? Start Here! Welcome to the wonderful world of forex trading. This is the place where all the money of the world goes. The largest market in the world. Larger than all the stock market of the world combined. Forex Trading is a kind of short term investing in currency or foreign exchange. Hence the name “forex” and trading as oppose to investing, where the goal of buying a currency is to sell it at a higher price in the future to make a profit. The goal of successful forex trading is to make a profit by buying and selling currencies of other countries e.g. US dollar, Japanese YEN, British POUND and others. You can learn more about forex trading on my post about “Why forex trading is the best business”. How much money can you earn in Forex Trading? The market is worth 4 Trillion Dollars. If you become a good trader, even a small slice of that pie can make you a millionaire. The challenge of course is knowing how to trade and how to get started. 1. You need a computer with internet connection. If you are reading this, then you are all set. 2.1 A dollar account at your nearest bank. You need this because you’ll be transferring money to other banks internationally. And the easiest way to do this is to open a dollar account. You can get more info on how to do this in my article. 2.2 No dollar account? Have no fear. You can try social trading and use Paypal to deposit and withdraw your earnings. Though I would recommend the first option more. 3. Forex brokers. Forex trading used to be for “the rich” only. But now, since the advent of the internet, there has been a lot of companies catering to normal people like us, called retail traders. We have list of brokers in this page. Brokers allows you to trade. They are the one who processes your request to buy or sell currencies. Its important to know your brokers well. 4. Your trading capital. You’ll need money to trade. How much money do I need to start forex trading? Contrary to popular belief, you don’t need a lot of money trading forex. You can get started in forex trading in any amount you like. I started forex trading with $100 and built it up from there. Some brokers have minimum deposit so you might want to look around, ranging from $100 to $10,000. We have a list of brokers here if you need any recommendations. I personally use these brokers. But I don’t have money yet. Or am afraid to trade. That’s ok. Maybe forex trading isn’t for you. And there’s nothing wrong with that. But before you quit just yet, why don’t you try demo trading to test the water. Its free and you’ll not lose money while doing it. The idea of demo trading is to open a demo account with a broker and deposit it with “play money”. You can trade online in real time but not at risk of losing real money. Its a very good way to learn how to trade. You may open a demo account from our list of brokers. That’s pretty much it. Its easy to get started in forex trading. I hope this article helps you in getting started in this wonderful, intellectually challenging endeavor. If you like this article, please consider liking us on facebook or sharing this with your friend. I always remind myself when doing forex philippines to wait, wait and be patient. Sometimes, when I look at the chart and a setup is just forming. My mind tells my eyes what I want to see and not actually what is forming. Making me enter trades that are too early or the set up is not that established, wasting money in the process. In forex trading, I think its more of a psychological business for the most part and only 1% technical. Why did I say so? It’s quite simple, in forex trading, you only need to buy or sell, to long or to short. There always 50% chance to profit and 50% chance to lose. But why is that 95% of all forex traders fail? It’s because its a psychological struggle. I am not in a way a professional or experienced trader. That is the purpose of this site. I keep my trades here so I can reflect back on trades I lost or won and hopefully gain experience in the process and also help individuals who find themselves at lost or struck with a heavy loss in the trade. For one thing, a loss in forex trading is always given and its how you manage your money that will separate you from a typical gambler to a successful forex trader. Having your emotions affect your decision in a trade is the most common thing why people fail. Greed, fear and anxiety is most of the time, the culprit why you have negative pips in your account. I try to remind myself again and again to trade based on what I see and not what I want to see. If I’ll lose, I hope to lose less and if I win, I win enough to cover my next 2 or 3 trades. Most of it is money management. The difference between a gambler and a trader is that, a gambler trades enough just to get his money back, in most cases, he won’t. A trader trades enough just to cover his future trades, giving him profit. I think the best way to describe ichimoku is that its a trend following indicator that gives you a graphical picture of where the support and resistance lines are. 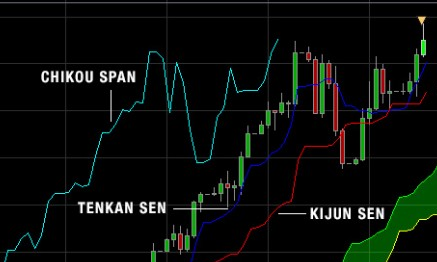 Contrary to most trading system, support and resistance lines are not a straight line in ichimoku. They vary depending where the price is going. So I finally started doing a post about the basics of forex trading. This post will not tackle the things like how the forex market work as you can head over to babypips.com or post in the comments section for that and we will try to answer you. We will talk about the things you need to get started trading. Things that are important to the success of your trading career and things you need to remember to not go bankrupt. To keep on trading and learning at the same time and not blowing your account. Your first goal in trading as a newcomer in this business is to last. Not to make profit, but to last. How many months can you go on trading before you hit 0 on your fund. We can mind the profitability later, what you need first and foremost is experience. 1. You Need to Have Money / Capital / Funds / Moolah – In order to make money work for you, you need to have your workers gathered up. Money makes more money if placed in the right spot. You don’t need to have a lot of it, just enough to get you started. $100 – $1000 is probably more than enough. 2. A Trading Account (Real and Demo) – You need a trading account to start trading in forex. There are a lot of brokers around the internet and I suggest you do some research first before giving them your money. There are a lot of scams out there so be careful. You need a demo account to practice your trading strategy. You need real account to practice your trading strategy with the components of emotions and the feeling of earning and losing money. 3. A Trading Strategy – In any business, you need a strategy and forex is the largest business in the world. Your entry and exit strategy and money management skills will play a big role in your success. Create your own trading strategy and practice it with your demo account for at least 6 months. You can develop you own trading strategy or customize the strategy of others. You can find a lot of strategy from books and indicators. Do your research well and practice it. Just make sure you follow it when you trade, you already invested a lot of time developing it. 4. Competitiveness – Forex is the battle between the bulls and the bears. The buyers and the sellers. You will win and lose sometimes. The important thing is, do you have what it takes to get back up in case you lose? The players in the forex market are billionaires, banks, retired generals, business tycoons, politicians, managers, retired olympic athletes which are the most competitive people in the world and you’re about to take them head on. You should be well prepared of the lost and keep moving on up to the point till you become successful. 1. Emotions – Its like poker. Emotions cloud your judgement. You need to have a strategy and the discipline to follow it. Do not give in to emotion. Emotion has no place in the market. 2. Ego – You don’t need ego. Admit it when you’re wrong and cut your losses. If you have questions or suggestions for the next forex 101 series of posts, kindly put them in the comment section below. Forex Trading – The Best Business? I think I’m inlove with businesses. Once I see an opportunity, I always wanted to pursue it. But like all busy people, time is the major problem. The most exciting part in doing business is the first few years of it. Its the most exciting where a lot of problems happening and problem solving is a thrill rush. But when I have an idea for a new business, I always do a check to my long term goal. After a few years, 20 or so, I want to retire. Or make money / trade anywhere / anytime and the only business that I can think of that fits the criteria is forex trading. When I think of food business. I think of customer service (which I hate). Then think of forex where customer service is not present. Forex trading is the best business model in my opinion and my long term goal should be (logically) go this way. Studying and learning more about forex and testing strategies should be mandatory if I want to be profitable in this trade. What do you think? Do you think forex trading is the best business model?